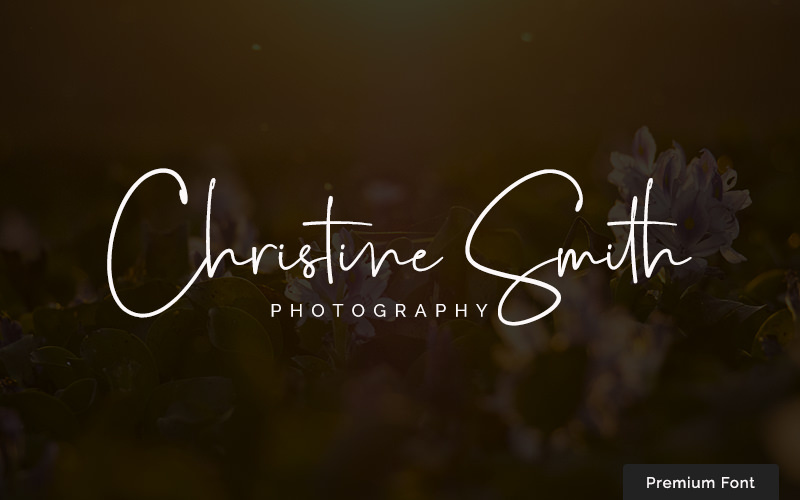 Recently I finished my “100 free photography logo templates” challenge where I made 100 photography logos that anyone can use. About two months have passed since then and those logo templates have been downloaded more than 12’000 times by now. A couple of days ago I checked out the download statistics and noticed that logos with fonts that look handwritten are more popular than others! 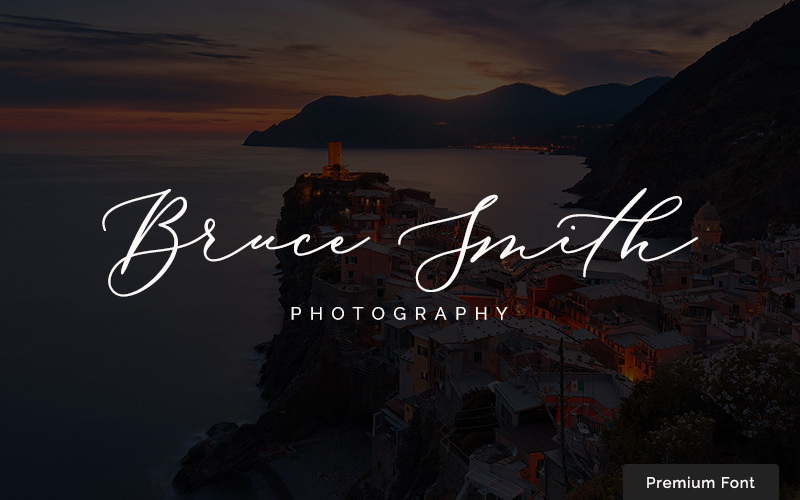 This made me think that many photographers are looking for a logo that looks personal – as if signed by hand. So I decided to share with you all of my go to signature fonts – both free and premium! With these, you can create your own unique logo or watermark. Most of these signature font examples are free for personal use and most of them come with a free commercial license as well, so if you plan to create a logo for yourself you can use all of these fonts, but if you plan to sell whatever you create from these, pay attention to the license. I made simple logo examples with each of these fonts and you can see them in the images below. The word “photography” in each example is written using “Raleway” font and you can download it here. Hope you’ll love these fonts as much as I do! Milkshake by Laura Worthington is a thick brushed script font. It’s very well executed and study. This signature font has a friendly feel to it. Milkshake’s bold, round shape works great against busy backgrounds making it an ideal watermark and logo font. It’s free for personal & commercial use and you can download Milkshake here. JackBlack by Typadelic is a casual script font. It has a simple, laid-back feel to it making it perfect for friendly, active photographers. JackBlack is free for personal & commercial use. Download BlackJack here. Beautiful Bloom by Mats-Peter Fross is really trendy right now. It’s handmade, fun, and beautiful. King Basil will work for practically anyone from portrait and wedding photographers to children and food photographers. This is a signature font free for personal use, you can download a free version of Beautiful Bloom font here. If you need this font for commercial purposes, it has a premium version with commercial use license here. Mightype is a free hand lettered script font by AF Studio. It’s premium quality and looks super chick. This font has some nice decorative accents that give a polished feel to it. Mightype will suit best for feminine photographers. It’s free for personal & commercial use. Download Mightype here. Sacramento by Astigmatic is one of my personal favorites and I’ve used it in a number of logo projects myself. It is a monoline script font inspired by hand-lettering work from 1950’s and 1960’s. It stands somewhere between the formal and the casual and has a professional no-nonsense feel to it. I imagine it working wonderfully for fine-art photographers. Sacramento is free for commercial use. Download Sacramento font here. Playball font by TypeSETit will work for photographers who are looking for an elegant, high-class, somewhat festive look. It’s free for personal & commercial use and you can download Playball font here. Hickory Jack is a weighted script font that has a striking, active feel to it. 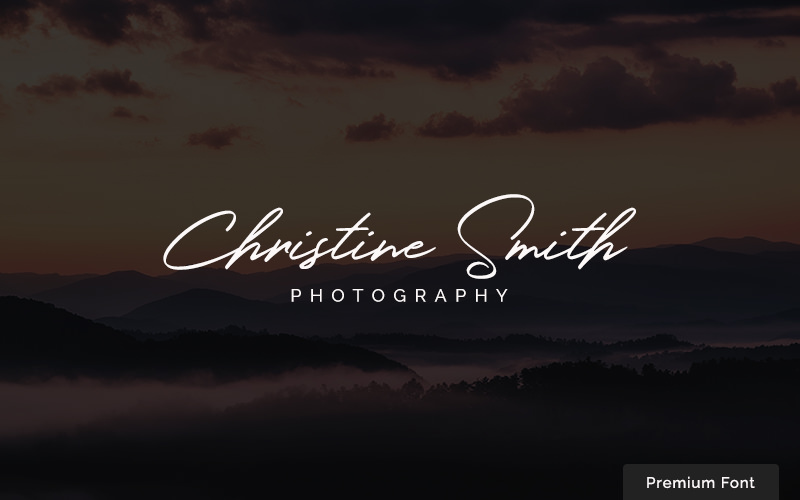 This one will make a proper signature font logo and will work well for both male and female photographers. Hickory Jack is free for personal use only. Download Hickory Jack font here. Streetwear by Artimasa is a bold, retro-inspired script font. Streetwear font will work great for sports and fashion photographers. Free for both personal & commercial use. Download Streetwear font here. Fabfelt Script is a monoline handwritten font by Fabien Despinoy. Thanks to its bold shape, it will work nicely on busy backgrounds and in small sizes. It’s certainly free for personal use, but I’m not quite sure about commercial use so if you need a commercial license, contact the font author just in case. Download Fabfelt Script font here. Bacana is a very interesting font by MAGOfonts. It’s best used on short words since each letter uses a lot of space. Because of its thin lines, make sure to use it on clean contrasting backgrounds. When used properly, this will make an elegant photography logo. Available for both personal & commercial use. Download Bacana font here. Cookie is a lovely font by Ania Kruk. It’s based on brush calligraphy and was inspired by 1950’s font styles that usually went with pin-up models and poster ads. It has a friendly, sweet look to it but it’s not too decorative or girly. It’s free for personal and commercial use and you can download Cookie font here. Magnolia Sky by StereoType is another one of my favorites and you can see it being used in a number of my free logo templates. Its carefree misaligned baseline gives this font a fun, friendly, and relaxed feel. Magnolia Sky is free for personal use only. Download Magnolia Sky font here. Signerica by Måns Grebäck is an extremely popular and beautifully executed font. As you can see from its name it is the perfect signature font for logo creation. Note that Signerica is free for personal use only. Download Signerica font here. If you are looking for something fancy, Herr Von Muellerhoff by Sudtipos is the signature font you need. This font was inspired by the intricate art of hand lettering and calligraphy in the 1930’s. It’s beautiful and precise and would be a perfect logo font for fine-art, high-class photographers. This font is free for personal & commercial use. Download Herr Von Muellerhoff here. Shellahera by Ryan Prasetya is another signature font with an uneven baseline. It’s made by scanning in handwritten brush pen. If you are looking for a font with a natural feel to it, this one is for you. Free for personal & commercial use. Download Shellahera Script here. Wildera by Lauren Lee is a fresh, new handwritten font. It’s elegant, feminine and free for both personal & commercial use. Download Wildera here. Quentin by GetStudio is an authentic handwriting font with a rough texture and dry strokes. It has natural, flowing curves and a signature touch to it making it a great signature font for both logo and watermarks. Quentin will look especially well on dark backgrounds. It’s free for personal use but I’m not 100% sure about commercial use. Download Quentin here. Arizonia is another calligraphic, decorative script font by TypeSETit. This one has a romantic, sensual feel to it making it perfect for photographers who capture love stories. If you’re a wedding, engagement or family photographer, Arizonia will suit you well. Free for personal & commercial use. Download Arizonia font here. Meddon by Vernon Adams is a decorative handwriting font that was created from the handwritten script of an 18th-century legal document. It’s free for personal & commercial use and you can download Meddon font here. Wild Youth is a beautiful hand-drawn brush script font from Jeremy Vessey. It has a distinct influence of adventure and the great outdoors. 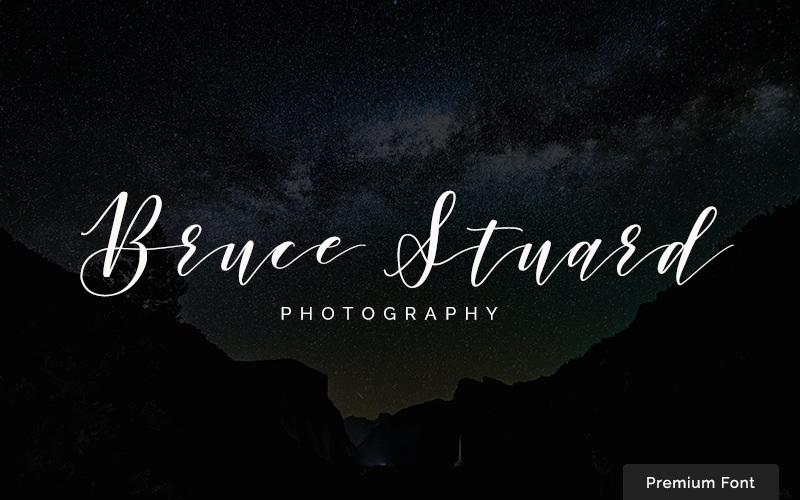 So if you are a nature or travel photographer, this signature font will make a perfect logo for you. Free for personal & commercial use. Download Wild Youth font here. Another signature script font by Måns Grebäck. I’ve used it many times myself when creating free logo templates. It has natural, flowing curves and looks as if written with an ink pen. Notera is free for personal use only. Download Notera font here. Selima is another signature font with an overflowing baseline but this one takes it a step forward with a messy, thick and thin look. Almost as if written with a soft, wet brush. Free for personal & commercial use – Download Selima font here. If you are looking for a signature font that really looks handwritten, Signatura is the one! It’s not only free for personal & commercial use but thanks to its mono-weight strokes, it looks like written with a ballpoint pen. Download Signatura font here. Click on Download and then type $0 in the amount box to get it for free. Rachella is a fancy, swirly font that comes with a bunch of swooshes for you to experiment with and it’s free for personal & commercial use. Download Rachella font here. Frutilla is a fun, modern calligraphy font that comes with swash alternatives for you to play with. I discovered this one quite recently and I already love it and use it whenever I can! Frutilla is free for personal & commercial use. Download Frutilla font here. Although this post started as a “free signature fonts” listicle, I can’t help but recommend some fonts that are well worth a couple of bucks. If you’re planning on creating a signature style logo for your own brand, consider spending $12-$22 in order to purchase a premium font. There are a couple of reasons for this: Your logo will be more unique because everyone can download a free font, but not everyone will splurge on a premium font choice. Paid fonts often are higher quality and they get updates to make them even better. Premium fonts offer multilingual support in most cases while free fonts almost never do. Silver South Duo is a classy, free-flowing, expressive script font perfect for signature logos. For $22 you will get 4 font variations – including ligatures and a serif font (I used the serif for “photography” in the logo example). Check out Silver South Duo here. Argentinian Nights is a gorgeous calligraphy font that’s really trendy right now. Trust me when I say that you won’t find anything quite like this for free. In will cost you $17 and will look amazing on everything – from logo to wedding invites, website elements and more. Check out Argentinian Night here. Holland is a classy, relatively simple but strong signature script font. I find myself using Holland font quite often on everything – especially logos. Holland will cost you $16 and you can check it out here. If you’re looking for a signature font that’s elegant, feminine and graceful, Biancha script is made for you! It has a beautiful and smooth flow to it making it perfect for a gentle, almost dreamlike brand feeling. Biancha currently has a 40% discount making it only $16 – so hurry up! Check out Biancha Script here. One of my all-time favorite signature fonts is called Sydney! Sydney script font looks amazing and for only $16 it’s a total bargain. 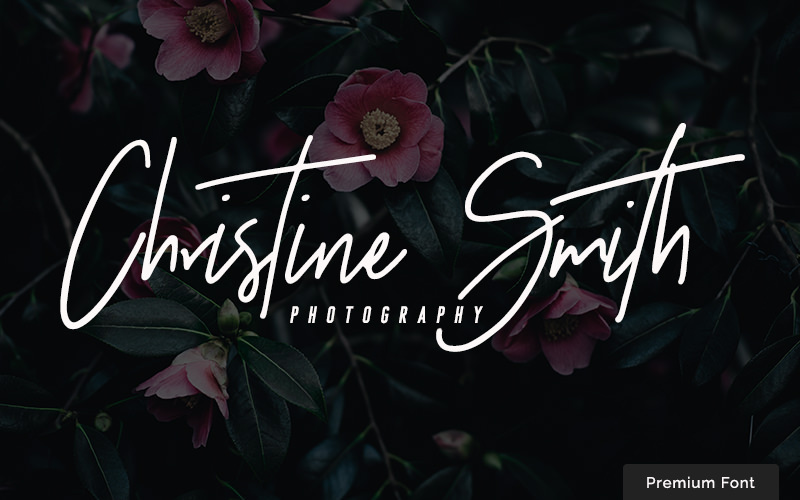 You not only get 2 signature script variations and a sans-serif font (I used the sans-serif for “photography” in the logo example), the font author gives you 12 ready-made logo templates as well! Make sure you at least check out Sydney font before you make your final choice – check it out here. If you’re looking for something that’s “fresh and new”, you must check out Wanderwall font by Chocotype! It was released just this summer (2018). Wanderwall is a beautiful monoline font that has an elegant, steady-handed flow to it and the best part is that this font will cost you just $12 so make sure you check it out here. Just Sunday is a feminine, confident script signature font with a smooth, wet ink texture. Each letter is very well executed, created with care and precision. Just Sunday font comes in Regular and Bold. The pricetag is $15 and you can check out Just Sunday font here. Hope you found free signature fonts helpful and inspiring! If you made a logo for yourself with any of these fonts, share your end result in the comments! Looking for a ready-made logo? Need something more detailed? 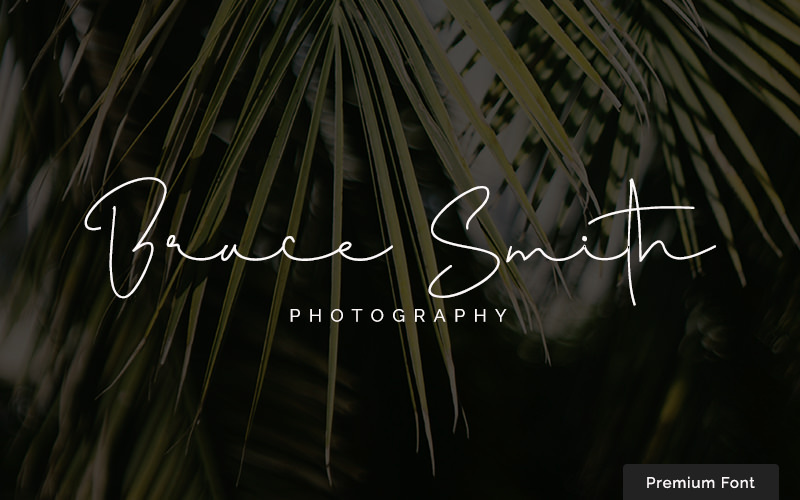 We have 100 free photography logo templates ready to use. 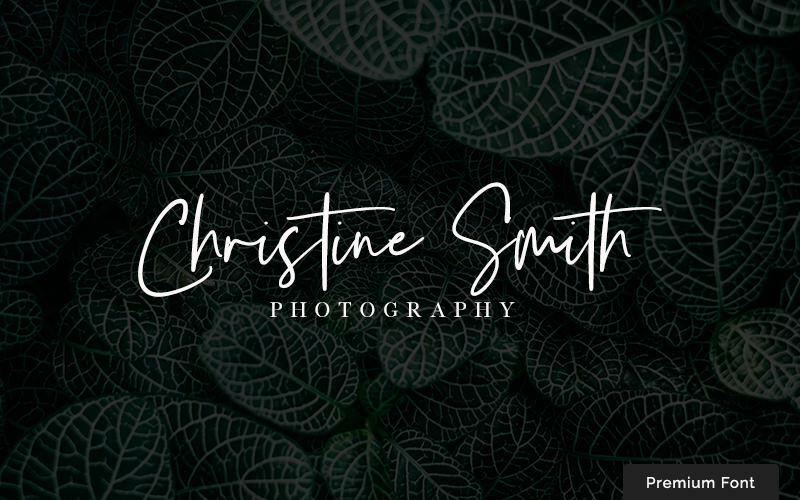 Check them all out here – 100 free photography logo templates. Amazing fonts, please keep on sharing. More power to y ou. Very grateful for your post and resources. Thank you for sharing. I really appreciate your page here and have been looking for fonts to use in my logo/signature. I have however come across something confusing and that possibly violates the terms: the licensing terms don’t allow for the purchased fonts to be used in your own trademark. I think that even if you never put TM near your signature or logo, it still counts as a trademark, especially if you’re branding all of your photos with it. Am I wrong? You are right – you can’t trademark a logo that’s made from a purchased font. That’s because rights to the font original belong to its author/designer. If you are looking to create an actual trademarked logo for your business, you need to hire a proper logo designer that will design a logo for you personally from scratch. This article is made for folks who just need a nice logo for their personal little business. All of these fonts can be used for personal use (to write your business name and post it on your website as a logo or print it on your business cards). Yes, if you use one of these fonts, someone else might decide to use the same font for their logo as well, but for a small startup or local business, that’s just fine. If you’re looking for a one-of-a-kind signature logo that you will trademark – free or even paid fonts won’t do. Dear very useful your post but can i download this fonts? Glad you enjoyed this post. You ca download all of these fonts by clicking on the “download … ” link under each font graphic. Really Helpful To All Photographer Nice Post Keep it up Bro! 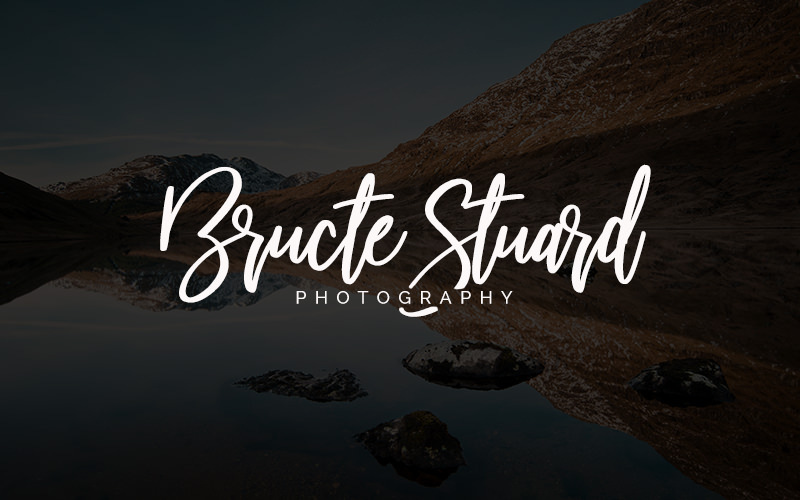 The fact that he forever became known as Bruce Stuard after the first font blew my damn mind. I’m all like, what happened to Bruce Stuart? This article is very helpful, thank you for sharing.